Life offers relatively few unambiguous win-win situations, but here’s one: berries, those sweet, natural treats that almost everyone loves may provide potent anticancer compounds. That’s the conclusion of Christine Sardo, who manages clinical trials on berry consumption and cancer prevention for Ohio State University’s College of Medicine. “We are promoting the concept of ‘fruitraceuticals’ as opposed to pharmaceuticals for cancer, and emphasizing prevention vs. treatment,” she told about 300 health practitioners at the Nutrition and Health Conference in New York City in May. The annual conference, sponsored by Columbia University’s College of Physicians and Surgeons and the University of Arizona’s School of Medicine, brings together the world’s leading nutrition scientists to discuss their latest findings. Sardo’s revelation was among the conference highlights. She detailed a study published in the March 1, 2006, issue of Cancer Research, in whichOSU Public Health professor Gary Stoner and four co-authors fed rats the cancer-causing chemical N-nitrosomethylbenzylamine three times a week for five weeks. After 20 additional weeks, rats that ate a diet consisting of ten percent black raspberries showed reductions in oral, esophageal and colon cancers of about 50 percent compared to rats that did not eat berries. “The berries prevented the entire spectrum of tumors from being initiated and promoted,” Sardo said. The idea of berries as anticarcinogens began in the late 1980s, when Stoner discovered that ellagic acid, found in many fruits and vegetables, inhibited the genesis of tumors. He then found that berries contained high amounts of ellagic acid, and that black raspberries in particular had more of this compound than all of the other berries he surveyed. Berries, said Sardo, may be natural counterparts of synthetic drugs such as Tamoxifen. “Studies show Tamoxifen can reduce the risk of breast cancer, but the studies have not evolved to look at the chemopreventive action of foods in our diet, of the things we eat everyday.” That’s a mistake, she said, because it may be that a combination of compounds, such as those found in foods, could be more effective than a single agent. 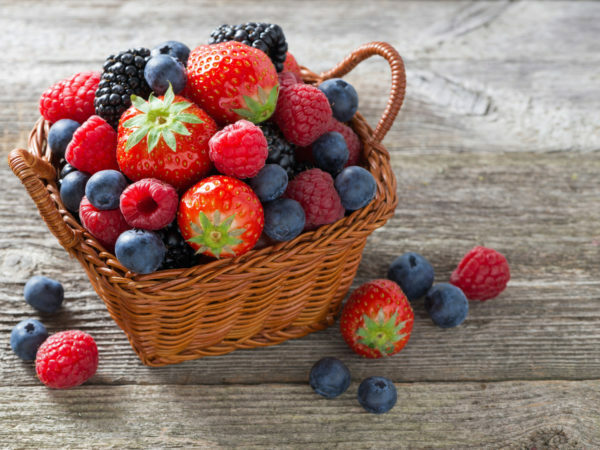 Indeed, there are other constituents in berries that can also prevent cancer, said Sardo, including calcium, folic acid, fiber and various phytochemicals. Acting together, Sardo said, the compounds in black raspberries slow the growth rate of pre-malignant cancerous cells, and they stimulate those cells to die, a process called apitosis. The next step is human trials, which Sardo is currently conducting. She is focusing on people with pre-cancerous lesions of the esophagus, mouth and colon, as these are the places where the compounds in black raspberries can be absorbed best. She feeds her human subjects about two ounces of freeze-dried black raspberries daily, the equivalent of about a pound of fresh black raspberries.